Modern authentication flows incorporate new challenge types, in addition to a password, to verify the identity of users. We generalize authentication into two common steps, which are implemented through two APIs: InitiateAuth and RespondToAuthChallenge. A user authenticates by answering successive challenges until authentication either fails or the user is issued tokens. With these two steps, which can be repeated to include different challenges, we can support any custom authentication flow. You can customize your authentication flow with AWS Lambda triggers. These triggers issue and verify their own challenges as part of the authentication flow. You can also use admin authentication flow for use on secure backend servers, and the user migration authentication flow to allow user migration without requiring your users to reset their passwords. The user enters their username and password into the app. The app calls the InitiateAuth method with the user's username and SRP details. This method returns the authentication parameters. The app calls the RespondToAuthChallenge method. If the method call succeeds, it returns the user's tokens, and the authentication flow is complete. If another challenge is required, no tokens are returned. Instead, the call to RespondToAuthChallenge returns a session. If RespondToAuthChallenge returns a session, the app calls RespondToAuthChallenge again, this time with the session and the challenge response (for example, MFA code). If you don't have an end-user app, but instead you're using a Java, Ruby, or Node.js secure back end or server-side app, you can use the authenticated server-side API for Amazon Cognito user pools. The server-side app calls the AdminInitiateAuth API (instead of InitiateAuth). This method requires AWS admin credentials. This method returns the authentication parameters. Once it has the authentication parameters, the app calls the AdminRespondToAuthChallenge API (instead of RespondToAuthChallenge), which also requires AWS admin credentials. Pass ADMIN_NO_SRP_AUTHENTICATION for the ExplicitAuthFlow parameter in your server-side app's call to CreateUserPoolClient or UpdateUserPoolClient. Choose Enable sign-in API for server-based authentication (ADMIN_NO_SRP_AUTH) in the App clients tab in Create a user pool. For more information, see Configuring a User Pool App Client. Amazon Cognito user pools also enable custom authentication flows, which can help you create a challenge/response-based authentication model using AWS Lambda triggers. 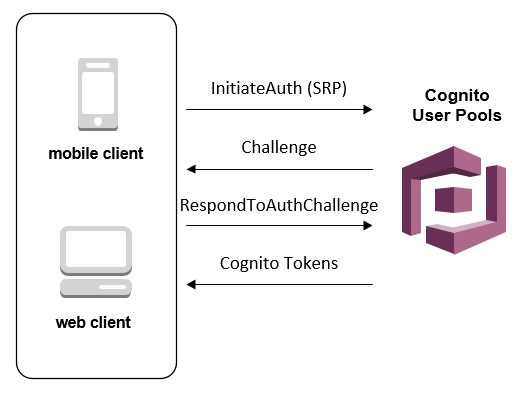 If Amazon Cognito responds to the InitiateAuth call with a challenge, the app will gather more input and call the RespondToAuthChallenge API, providing the challenge responses and passing back the session. Amazon Cognito responds to the RespondToAuthChallenge call similarly to the InitiateAuth call, providing tokens if the user is signed in, another challenge, or an error. If another challenge is returned, the sequence repeats with the app calling RespondToAuthChallenge until the user is signed in or an error is returned. More details are provided in the API documentation for the InitiateAuth and RespondToAuthChallenge APIs. An app can initiate a custom authentication flow by calling InitiateAuth with CUSTOM_AUTH as the Authflow. With a custom authentication flow, the challenges and verification of the responses are controlled through three AWS Lambda triggers. The DefineAuthChallenge Lambda trigger takes as input a session array of previous challenges and responses and outputs the next challenge name and booleans indicating if the user is authenticated (and should be granted tokens) or if the authentication has failed. This Lambda trigger is a state machine that controls the user’s path through the challenges. The CreateAuthChallenge Lambda trigger takes a challenge name as input and generates the challenge and parameters to evaluate the response. CreateAuthChallenge is called when DefineAuthChallenge returns CUSTOM_CHALLENGE as the next challenge, and the next type of challenge is passed in the challenge metadata parameter. The VerifyAuthChallengeResponse Lambda function evaluates the response and returns a boolean to indicate if the response was valid. A custom authentication flow can also use a combination of built-in challenges such as SRP password verification and MFA via SMS, and custom challenges such as CAPTCHA or secret questions. If you want to include SRP in a custom authentication flow, you need to start with it. To initiate SRP password verification, the DefineAuthChallenge Lambda trigger returns SRP_A as the challenge name and SRP_A in the authentication parameters map. Once the password is verified the DefineAuthChallenge Lambda trigger will be called again with PASSWORD_VERIFIER in the previous challenges array. MFA will be done automatically if it is enabled for a user. For more information about the Lambda triggers, including sample code, see Customizing User Pool Workflows with Lambda Triggers. These admin authentication APIs require developer credentials and use the AWS Signature Version 4 (SigV4) signing process. These APIs are available in standard AWS SDKs including Node.js, which is convenient for use in Lambda functions. In order to use these APIs and have them accept passwords in plain text, you must enable them for the app in the console or by passing ADMIN_NO_SRP_AUTH for the ExplicitAuthFlow parameter in calls to CreateUserPoolClient or UpdateUserPoolClient. The ADMIN_NO_SRP_AUTH AuthFlow is not accepted for the InitiateAuth and RespondToAuthChallenge APIs. In the AdminInitiateAuth response ChallengeParameters, the USER_ID_FOR_SRP attribute, if present, will contain the user's actual username, not an alias (such as email address or phone number). In your call to AdminRespondToAuthChallenge, in the ChallengeResponses, you'll need to pass this username in the USERNAME parameter. Because it's designed for back-end admin implementations, admin authentication flow doesn't support device tracking. When device tracking is enabled, admin authentication succeeds, but any call to refresh the access token will fail. A user migration Lambda trigger allows easy migration of users from a legacy user management system into your user pool. To avoid making your users reset their passwords during user migration choose the USER_PASSWORD_AUTH authentication flow which sends your users' passwords to the service over an encrypted SSL connection during authentication. When you have completed migrating all your users, we recommend switching flows to the more secure SRP flow which does not send any passwords over the network.